Saturday, December 14 1907 -- "Uncle Joe" Cannon was the Speaker of the House of Representatives, a veteran Republican strongman. Though he might 'never have been better prepared' to run for the presidency, I can find no evidence that his interest in the position was shared by anyone else, and he was never a serious contender. 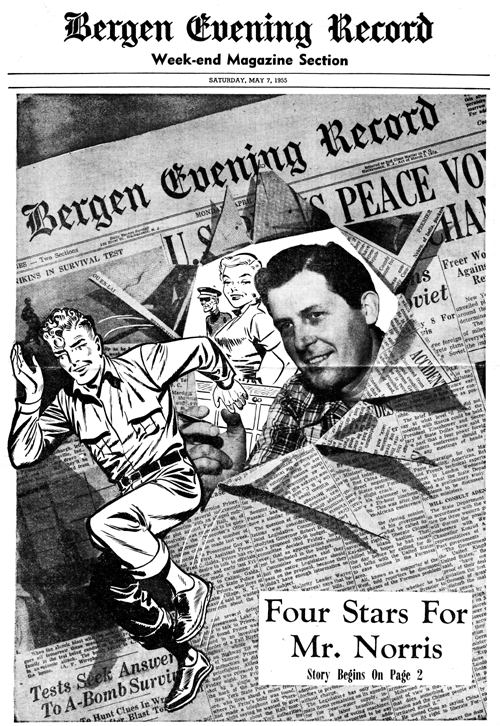 Here's a real moldy oldie from the files of Cole Johnson, a New York World Sunday series that somehow managed to fly under the radar of Ken Barker's index of that paper. Or perhaps not -- since Barker indexed by artist, he just might never have seen one of these signed, as these two examples aren't, and so it didn't qualify for his index. Professor Prestochange, a magician strip which ran from July 22 to October 21 1900, is, Cole tells me, by a fellow who signed himself C. Howard. Beyond that I haven't much to say other than the strip certainly is graphically fine and shows a pretty good grasp of comic strip conventions and timing for a fellow who has only this one credit to his name. Hello, Allan---The artist was Charles J. Howard, who's main claim to fame was the creator of the comic, or "Vinegar" Valentine in the 1870's. He drew hundreds of these for McLaughlin Bros. printers in Brooklyn, for more than thirty years. ---Cole Johnson. This blog has to be one of the most important and exciting art sites on the net. I'm amazed that you and Cole Johnson are able to find so many treasures that nobody else knows about. 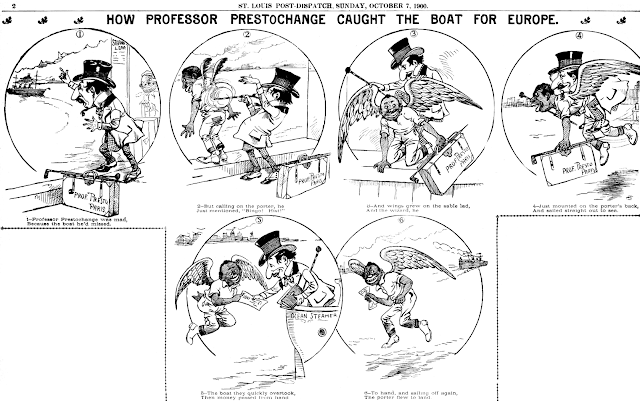 The UPC (United Publishers Corporation) News Service was a minor syndicate that seemed to specialize mostly in business and economics features, but for reasons unknown they liked to keep a contingent of just one comic strip on their roster. The earliest one of these that I'm aware of is Soosie the Shopper, a delicious trifle about a pretty girl who is clothes-shopping mad, and her poor Daddikins who has to foot the bill. The strip has no pretensions to greatness, but the superbly madcap art of Charles Forbell (perhaps best remembered for his exquisite Sunday series Naughty Pete) succeeds in overcoming the hackneyed gags by some fellow named Floherty. Sadly, the series was short-lived. I'd like to think it was because Charles Forbell had better things to do -- but if he did I don't know where he did them. 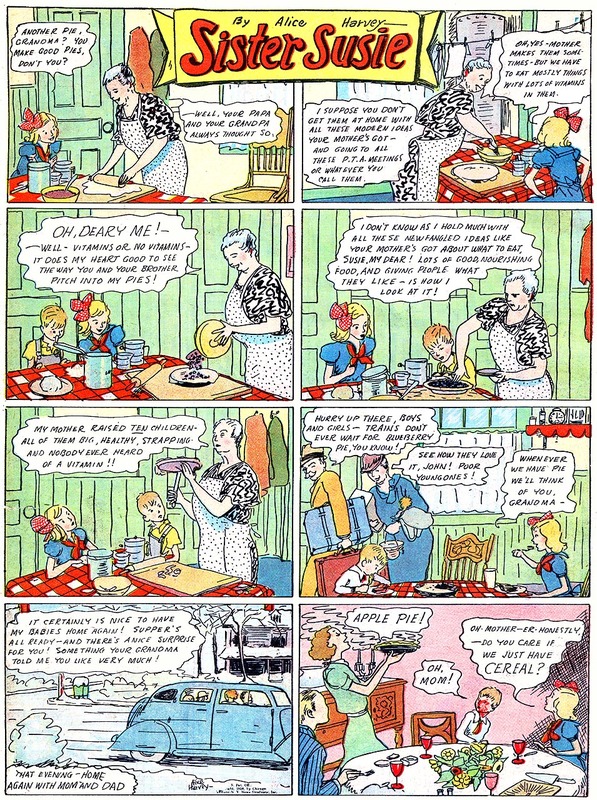 He next pops onto my radar in 1929 with an even more obscure comic strip, Cuddles. Susie the Shopper ran in a very small client list of papers, the longest run of which I've encountered runs from April 6 to October 17 1925. I'd take this strip over 75% of the strips that are currently running in my papers. Hello, Allan----The collaborator on this strip is John J. Floherty, Jr. (1907-1977). He did cartoons for Life, Judge, New Yorker and others, and graduated to covers and serious illustration. He usually signed his work "Floherty Jr."-----Cole Johnson. But that would make him just seventeen or eighteen at the time of this strip. Is there evidence he's the Floherty we're looking for? Hello, Allan--Perhaps I just made a leap of faith here, but I just assumed that Floherty is your man here as I usually find him in the company of people like Farr.---Cole J. It's a long, circuitous haul from the grain and tobacco fields of Greenville, O. (Pop. : 8,820), to a daily spot on the comic pages of 184 American and Canadian newspapers. But when you're riding on talent, the trip goes much faster. And, although artist Paul Norris of Hillsdale had his ticket punched at a few whistle stops along the way, he still made the grade at an early age. 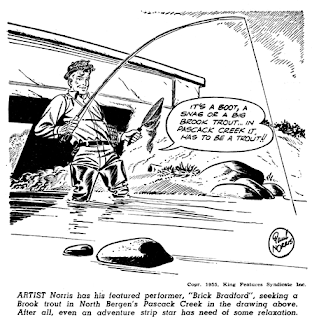 Today he is recognized as one of the top men drawing for the King Features Syndicate. Paul's current assignment is turning out the "Brick Bradford" science fantasy strip 6 days a week — it joined the Record's family on Monday —and if Paul accomplishes nothing else in this world, he will have achieved one phase of immortality. For he was the boy voted most likely to succeed during his undergraduate days at Midland College in Fremont, Neb., and he went ahead and succeeded, in defiance of tradition, which says that the people most likely to succeed usually wind up as embezzlers or stealing candy from babies. Paul's success didn't come easily; it was achieved only through hard work and much burning of the midnight oil. But once his fortune changed, it changed quicker than a tote board at Jamaica. Tonight he can go to sleep counting his blessings: a fine wife, two talented sons, a home in the Holiday House development off Werimus Lane in Hillsdale that has everything but gold-plated plumbing fixtures, and the knowledge he's reached the top in his chosen profession. Norris, a handsome 6-footer who blew out 41 candles on a birthday cake a week ago last Tuesday, first saw the light of day in Greenville, O., and has been drawing for as long as he can remember. He sold his first work during his senior year in Palestine, 0., High School—several editorial cartoons used by the Dayton, O., Daily News—and, with his imagination fired, landed a job during the depression as a card writer with J. C. Penny Co. in Greenville. The job didn't last long, however, so Paul—with his mind set on becoming an editorial cartoonist— headed for Midland College to study journalism. His first year there he became art editor of the yearbook and, in his own words, "no actor ever stole a scene more viciously than I took over that book." Like a good many other cartoonists, among the most noted being Otto Soglow, Paul's affections were evenly divided between art and the drama and it was a tossup, he says, whether he would try starving as an actor or as a comic strip artist. 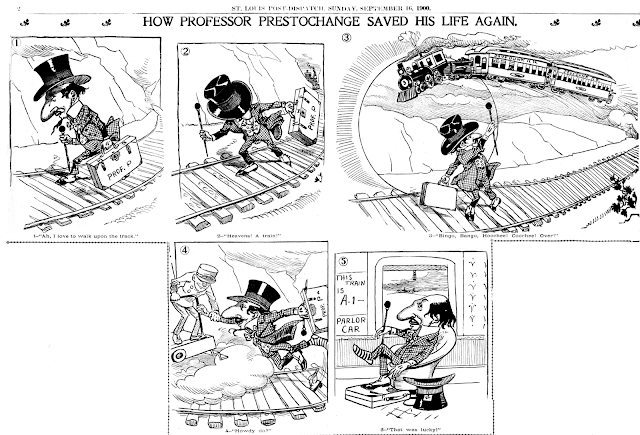 Finally, in his sophomore year at Midland—after he had been voted most likely to succeed—he hibernated to his grandmother's farm to work out 8 weeks of drawings for a syndicated strip. The strip sold to a syndicate, all right, but turned out to be a quickie affair and went down faster than an old maid's bedroom shade. "There followed," Paul says gravely, " a period of idleness. Most people considered it downright laziness, but 1 prefer to look back on it as a plateau of learning." Soon this "plateau of learning" gave way to a day-time job in a Dayton factory while at night Paul attended the Dayton Art Institute, which provided a background for his meeting with pretty Annbeth Mayenschein, now Mrs. Norris. 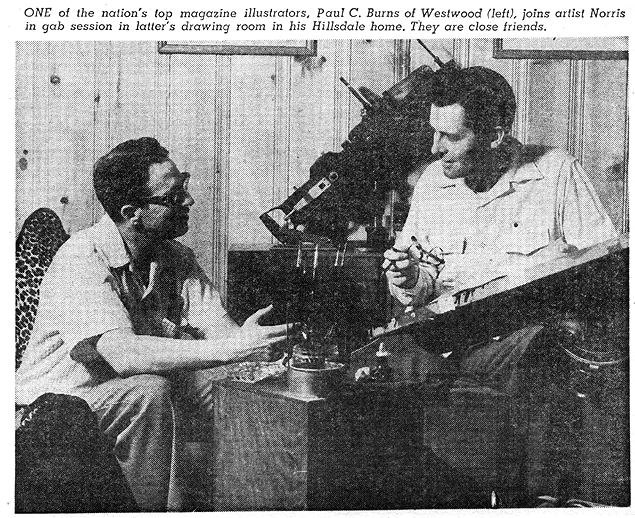 It was here, too, that he made a connection with the Dayton Daily News and, under the guidance of Art Editor Myron E. Scott (now the man in charge of the national Soap Box Derby), Paul did a comic page that ran for several years. 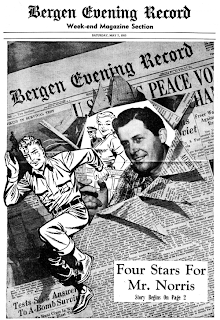 By 1940 Paul thought he was ready for the big step: a move to New York City. And, with the encouragement of Milton Caniff, the artists' artist whom Paul knew in Dayton, he traveled East and proceeded to do comic book drawings for several publishers. Then one day came the big break: a phone call from the now out-of-business newspaper, PM. "Caniff had been pointing his finger at me," Paul says, "and before I knew it, I was drawing the 'Vic Jordan' strip. Sometime later King Features called with an offer for me to draw 'Secret Agent X-9' and I quickly accepted." For 3 months everything ran smoothly and Paul seemed on his way to the top. But events at Pearl Harbor forced an interruption of some 30-odd months. 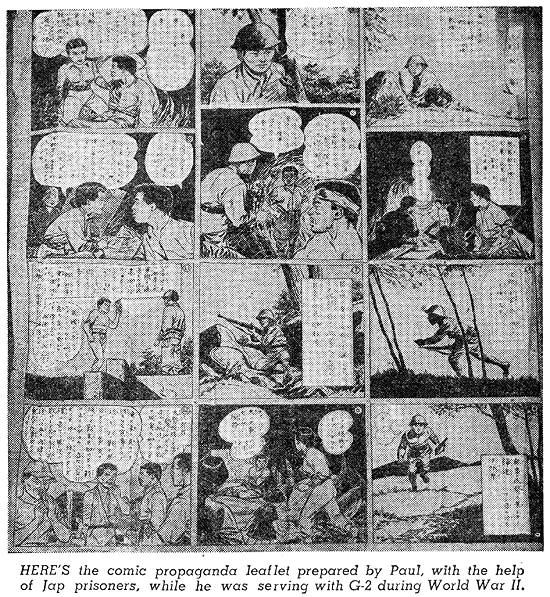 Paul became Uncle Sam's guest on a trip half-way around the world working for G-2 in the Tenth Army and drawing assorted propaganda leaflets, sketching Jap caves and gun installations, and "cooking up my secret weapon—a propaganda comic book". Propaganda comic book? What, pray tell, was that? "Well, actually it was this way," Paul elaborated. "I was assigned to the Signal Corps when I entered the Army and at Leyte I met two officers from Joint Intelligence, who were seeking a cartoonist to prepare leaflets to be dropped on Okinawa. I volunteered for the task and, while aboard a ship in the Okinawa invasion fleet in 1945, I drew the illustrations for the leaflets. "They worked out so well, and so many Japanese soldiers surrendered, that word got to General Bruckner and he had me transferred from the Signal Corps to the psychological warfare branch of G-2 in the Tenth Army. That's when I got the idea for a propaganda comic book. You see, 'Jiggs' and 'Popeye' were very popular strips in Japan. I thought if we could come up with propaganda strips involving these comic figures, it should prove very effective. However, before we could complete the job the atom bomb was dropped and the war ended." 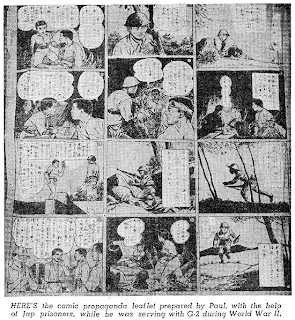 Working with Jap prisoners of war, Paul said, one comic layout was completed but never used. A picture of it accompanies this article. It was a series of 12 drawings, with Japanese writing, tracing a Japanese soldier's experiences from the time he found an American propaganda leaflet until he surrendered. "Turning out that strip was something," Paul recalls. "I needed someone to insert the Japanese writing and was told one of the prisoners spoke some English. Locating him in the stockade, I said very slowly: 'I ... understand . . . you . . . speak . . . English? To which the prisoner responded: 'I speak a wee bit, old chap.' I then learned this Jap master sergeant was named McNeil. His mother was Japanese, all right, but his father was a Scotch seaman. He spoke English as well as I did." 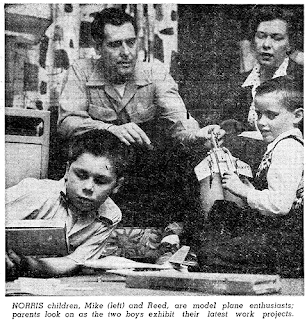 When the war ended, Norris returned to King Features and began illustrating syndicated mystery stories and the "Flash Gordon" comic book series. 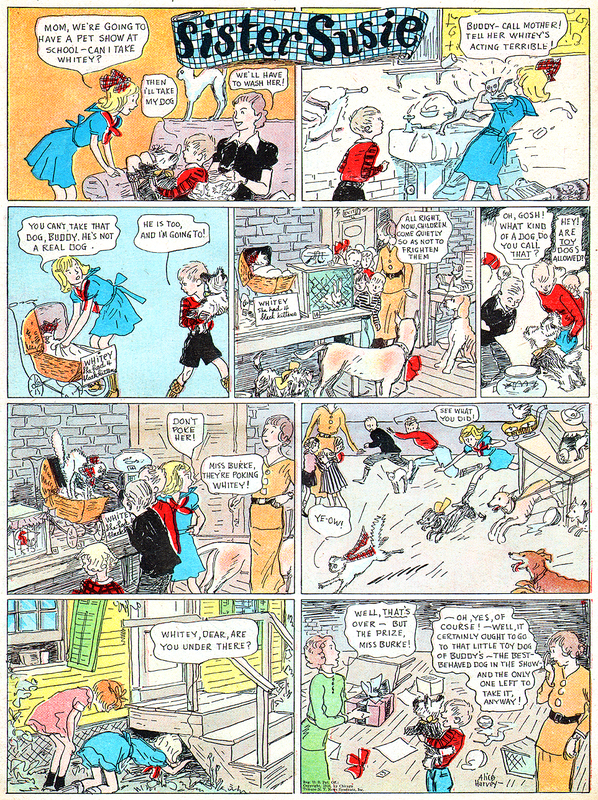 During the summer of 1948 he was also asked to do "Jungle Jim", an adventure strip which proved exceedingly popular, and in the early 1950s he started doing the daily adventures of "Brick Bradford". It was a few years back that the Norris family— Paul, Ann, Michael, 12, and Reed, 6—moved to Westwood and it was here that a rather amusing episode took place. Paul, relating the incident, grinned like a Boy Scout receiving his first merit badge. "I worked on my books and 'Jungle Jim' in my drawing room," he said, "and consequently I was home more than I was away. This seemed to mystify some people, who didn't know if I was unemployed or what. It finally got to be too much for one of them and she stopped Mike one day and, among other things, asked him what I did. Said Mike: 'Oh, Pop makes book!' He meant I drew for comic books but I often wonder if that woman really thought I was a bookmaker!" For the benefit of Paul's neighbors in his new home in Hillsdale—the Norrises moved in last September—this might be as good a time as any to repeat why Paul's home so much: his drawing room is there, it takes him between 3 and 4 days to turn out the week's quota of six strips, he's not unemployed or a bookmaker! 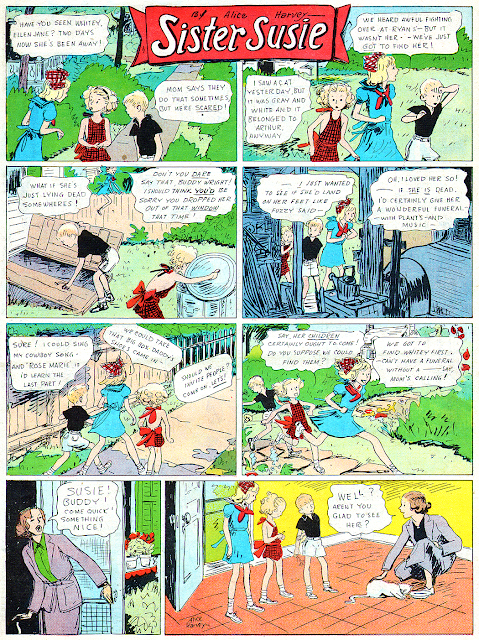 Regarding the "Bradford" strip, Paul says he limits sequences to from 6-8 weeks—feeling continuity in adventure strips should not lag—and uses his two sons as a barometer:"If it's getting uninteresting to them, I know it's time for a quick change." He says he's luckier than most artists since his strip is not confined to one area or era. Brick can be in the Pacific today; then moved to a planet when the current sequence ends. 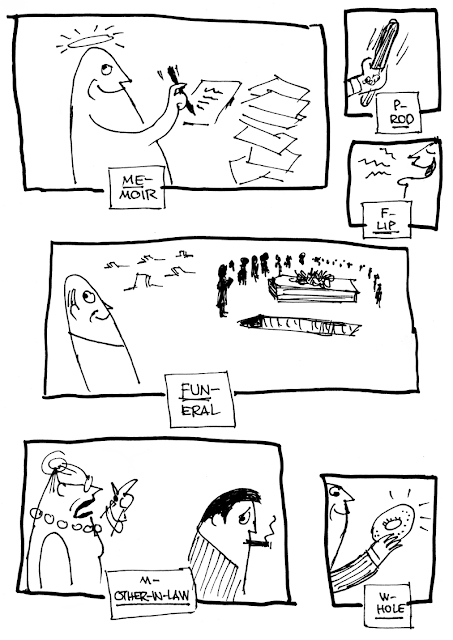 Ideas for the strip just seem to come, Paul says. Some are from current or past events, with names and places changed but facts kept intact—with some fantasy added. 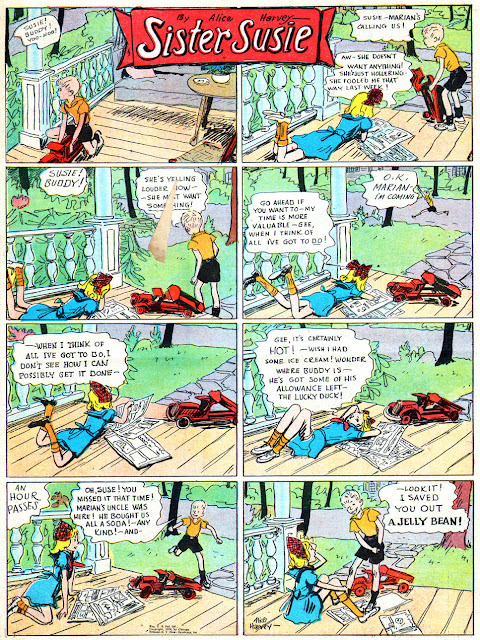 "Brick Bradford" is the strip's only continual featured character, most others being dropped after appearances in a single sequence. Occasionally a character from one sequence will put in an appearance at a later date but this is the exception, rather than the rule. Paul says readers of the strip send all sorts of bouquets and brickbats but that he tries to answer every letter. Samples: when he was doing the "Vic Jordan" strip the scene was the French underground and he used a character known as The Glove. He received a nasty letter from a reader who said Paul drew American noses on all the Continentals in the cast. Another man complained of the way Paul had his characters tie neckties. The knots were not big enough, he asserted. Meeting the Norrises in their luxurious, 7-room home, it is quickly apparent that talent runs in the family. Both Michael and Reed draw better than their young years should permit and both are clever when it comes to putting model planes and cars together. In fact, a model plane turned out by Mike served as Paul's model for a plane you'll see in his strip of June 6. Ann Norris is a fine photographer and a good homemaker. She also has contributed in the way of decorations for the home, having painted a number of articles and collaborating with Paul in making a most unusual lamp. Paul's talents aren't confined to art work, either. 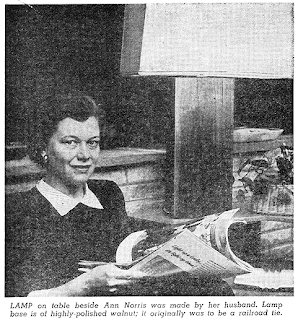 Occupying a prominent place in the raised living room are two modern lamps he made from walnut wood scheduled to become railroad ties at the Ohio plant of his father-in-law. A photo illustrating one of these lamps is included in this article but no photograph could do justice to the project. He also spends considerable time making home movies ("You're lucky," he said. "Usually when anyone has been here this long I've had the blinds down, the screen up, and the projector whirring.") and is quite proud of a 400-foot movie he made in color for the Westwood Intermediate Girl Scouts. A bug on traveling, he also has numerous travelogues in his reel collection. Another favored pastime is running his Lyman outboard motorboat-he tows it 700 miles to Ohio whenever he returns to the hometown— while other interests include golf, television, and reading, with the latter two taking up much of his time. Yes, it's a long, circuitous haul from Greenville, 0., to success in the cartooning field—one of the toughest professions to break into you'll find. But Paul Norris, riding on talent, made the trip successfully—just as his classmates at Midland College said he would. And everyone who knows him is quick to report, it couldn't have happened to a nicer guy. --article provided by Mark Johnson -- thanks Mark! wow, wow and WOW! I grew up reading Paul Norris' Brick Bradford in the Brockton (Mass.) Enterprise and Times, following it til it was dropped in '85 for Jim Meddic's Robotman (now Monty)... I never knew Norris was such a great, incredible talent! He turned Brick's adventures into a world of sci-fi fun that was much much better than Flash Gordon! How I miss his version of Brick! In the 19th century it became more and more fashionable for ladies to be thin, though the pendulum still swung both ways. By the 20th, though, both men and women were no longer considered hearty and healthy if they packed on the pounds, and diet and exercise became an obsession throughout the western world. 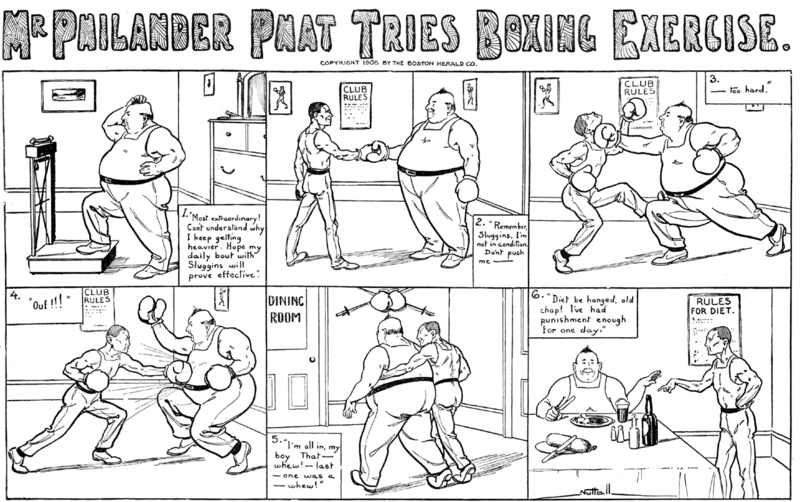 The fashion took longer to take hold for men, but heavyweight President Grover Cleveland, who came in for a lot of ribbing about his weight, brought the issue front and center in the U.S. The pear-shaped Mister Philander Phat has the same contours as the bulbous president and shows that the obsession with being thin had indeed invaded the male public consciousness. 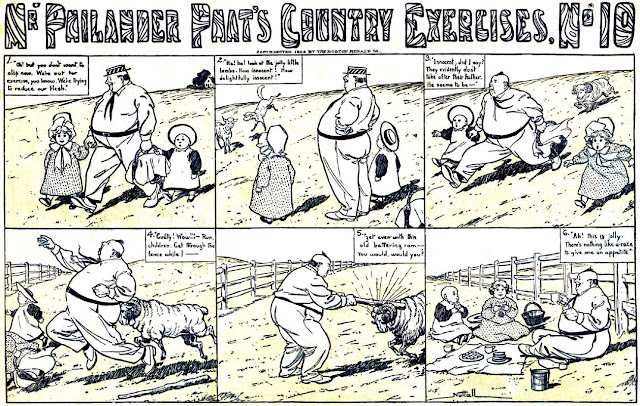 Mister Philander Phat ran from May 20 to October 28 1906 in the third and final version of the Boston Herald's Sunday comics section. The title Mr. Philander Phat's Country Exercises was used from July 1 to September 9. Of the cartoonist, George Nuttall, I know little. 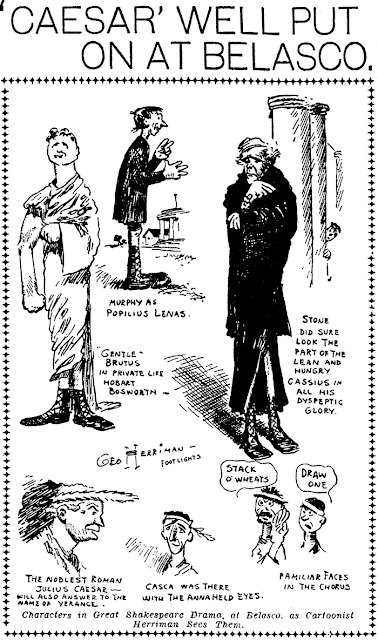 Obviously he is an accomplished penman, and I seem to recall that he was an editorial cartoonist in the 1910s and 20s, though at the moment I can't seem to find proof of that in my files. 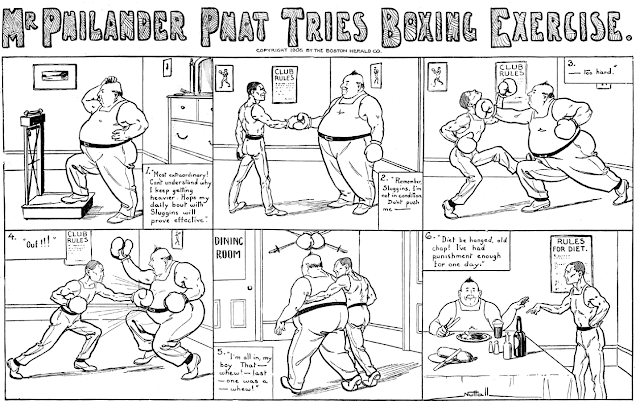 Over 35 years after Mr. Philander Phat he made a return appearance in the funnies, taking over the reins of Morris Weiss' It Never Fails for four months. A layoff of that length must be some sort of record. Hello, Allan----One of George Nuttall's tasks about this time was as the first illustrator of Thornton W. Burgess' "MOTHER WEST WIND" books, replaced by Harrison Cady.-----Cole Johnson. 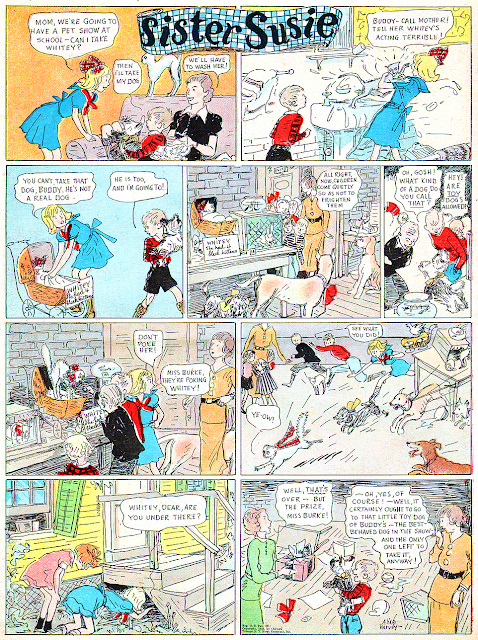 Alice Harvey is celebrated as one of the New Yorker's great cartoonists, her demure sophisticated ladies with acid tongues a constant popular feature of the magazine's pages from its inception until the early 1940s. But she also took her turn in the newspapers with a delightful feature titled Sister Susie. This suburban comedy featuring real kids showing all their warts was unusually frank and unvarnished look at children for the Sunday papers of the time. It is rare to find a mention of this beautifully drawn and well-crafted strip in references, and one of the few mentions is an unfairly tepid one from historian/cartoonist Trina Robbins in her book A Century of Women Cartoonists, in which she describes Sister Susie as a mere "cute girl strip." What a shame; she must not have been able to locate but the one example she showed there (a weaker effort, granted). I hope the examples above will dispel the notion that this was any mere trifle. Sister Susie was a Chicago Tribune-New York News Syndicate product that found its way into very few papers other than Daily News itself. It began running there on January 26 1936 and the last episode is reported to be on August 30 1936. However, I have a tearsheet from an unidentified source newspaper dated December 20th of that year with Sister Susie. Maybe it's a rerun, maybe it ran late, or maybe the series continued on longer than reported. Anyone have additional info? Very interesting. I wonder if fans of Skippy were more appreciative of it? Can you post the Dec 20 page? So we can check if it's a rerun. I added it as the fourth sample above. Streaky and Dopey Dildock, on the reverse, are both clearly dated December 20. Accidenti! It isn't a rerun! This page isn't among the 32 pages published from January 26 1936 to August 30 1936 on the Chicago Tribune. I came across 4-Chicago Tribune Comic pages copyright 1936- Featuring "Sister Susie" by Alice Harvey. After reading your blog and researching Alice Harvey Awesome Female Cartoonist, Made me even more Curious to when exactly these were created. New to this website unfamiliar how to post pictures of the pages. Any help would be greatly appreciated, I would love to Share! Thanks in advance for any help, and Great Blog ! I think we've got enough of a sampling of Sister Susie here (we don't go in for mass reprinting), but thanks very much for the offer! 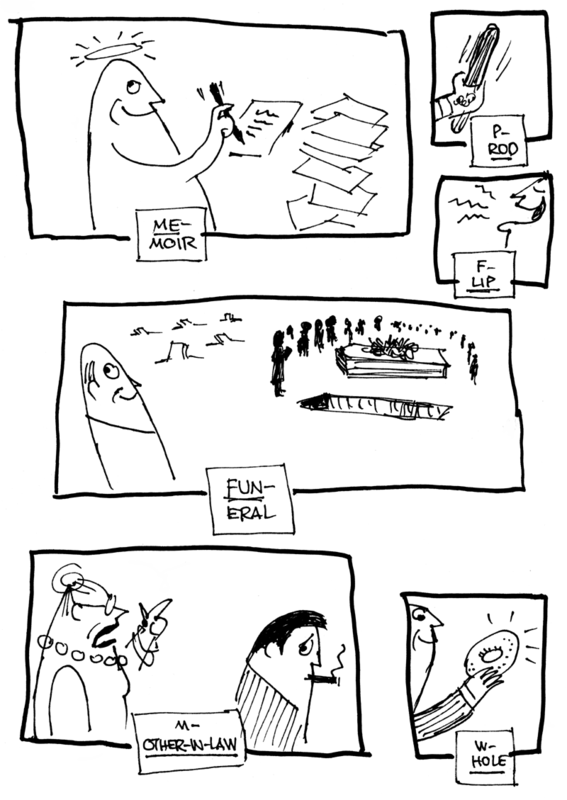 I love the first ones morbid sense of humor. The transition of staring off worried where the cat is then getting convinced it must be dead and then planning a funeral only to get disappointed that the cat is still alive, really well delivered.